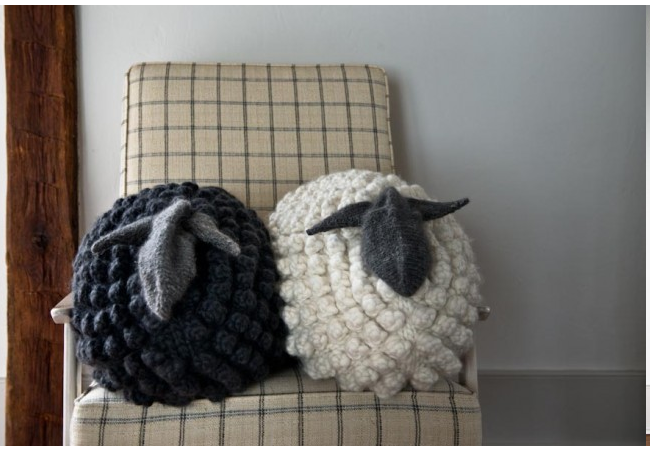 Either way, this sheep pillow is too fun. Here’s the big question: Will a project’s humor/joy/fun be everlasting enough to be commensurate to the effort? You never know at the beginning. For me, it depends on what’s in the stash; there’s an inexplicable joy in putting previously undesignated yarn to use. And if the project has a home before it’s started, well, that pretty much seals the deal. Like the year I knit 36 little pieces of coal for holiday gifts. Great response – only two people didn’t get it, and I realized those friendships were too lopsided to salvage. I think they did too. A little galvanizing moment worth the effort.